12.04.2017 (Hvino News). A leading American lifestyle magazine Vogue published the article entitled "5 Reasons to Explore the Mountains of Georgia". Written by Jennifer Murphy, the article outlines some of the most attractive touristic features of today's Georgia. "Georgians, a proud, gregarious, food-and-wine-obsessed people, may be the world’s most welcoming hosts. The Tbilisi airport even greets visitors with a Wi-Fi network named “TBILISILOVESYOU,” - the article reads. Apart from usual touristic musts like khachapuri and chacha, Jennifer Murphy pays attention to other important attractions, for example competitive prices for heli-skiing or paragliding. "Heli-skiing tops many adventure enthusiasts’ bucket lists, but to hire a chopper in powder meccas like Alaska, Japan, and the Alps can cost a small fortune. The Caucasus Mountains offer big lines and untouched terrain at half the heli-price tag ($160 per person compared to $390 in Switzerland)." "The mountain regions of Georgia offer endless adventures, from ice climbing and white water rafting, to mountain biking and mountaineering. For an adrenaline rush without much physical effort, try paragliding. ... In winter, ride the chair lift alongside skiers and soar through the clouds, high above snow-capped peaks, getting the ultimate view of the region before landing right on the slopes. Read the full Vogue article here. 05.04.2017. 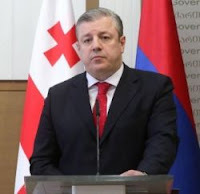 Tourism incomes have exceeded USD 2 billion, - Georgia’s Prime Minister Giorgi Kvirikashvili has said while delivering his speech at the UN World Tourism Organization Mountainous resorts third conference. According to the Georgian Prime Minister, the number of international visitors in Georgia has significantly increased as a result of the consistent and gradual approaches by the government. ‘In 2016 Georgia observed a record number of tourists, reaching 6.3 million. The tourist incomes have exceeded 2 billion USD. The newly-established visa-free travel represents the most important achievement for Georgian citizens that will further deepen and encourage contacts, business relations and tourism,‘ - Giorgi Kvirikashvili has said.